Cedar Wallace is the fiber fiend behind “Sheep Thrills”. She has been obsessed with fiber her whole life. All her yarns are handspun and dyed, or hand-dyed natural yarns. The dyes are wash and light fast. Handspun yarns can be purchased separately. Her new line of novelty yarns are thrice spun with bombyx silks, silk thread, bouclé and mohair blends. Each skein is unique and exotic. 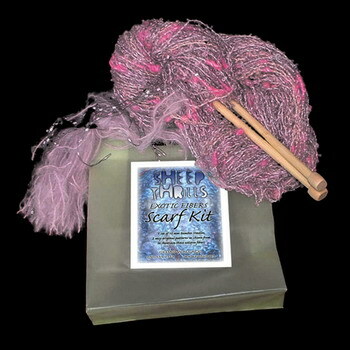 Her newly designed kits contain all you need to create your scarf. Wooden needles, yarn, two basic patterns and fringe are all included in a neatly packaged presentation. Makes gift giving a “Sheep Thrill”.